homeCLU - Get more power for charging your vehicle at home. Are you worried that you don't have enough power for charging? Do you want to charge more than one vehicle? Or do you just want to charge faster? Optimize your power usage with homeCLU and charge more efficiently. In theory, a homeCLU enables you to use almost all the available power in your home for charging. How efficiently you can charge in practice depends on your charging station, your charging cable, you vehicle and how much power you use for other purposes. The unit continuously monitors your power consumption and distributes unused available power to the charging station or stations. This means that you can charge at full capacity when your other consumption is low, even if you home has limited available power. Since this solution makes it possible to use almost all your available power for charging, you can install more charging stations or a station with multiple outlets. You can also charge more than one vehicle at the same time. In many homes, this would not otherwise be possible. More and more power companies are switching to a subscription model based on the peaks in your power consumption. Set homeCLU to a maximum level that matches your regular consumption to ensure that your charging doesn’t lead to costly peaks. homeCLU always prioritizes your regular consumption and won’t use any power you need for cooking, heating or other activities. When your regular consumption goes down, homeCLU ensures that the extra available power is used for charging. The installer mounts the homeCLU unit in your fuse box. 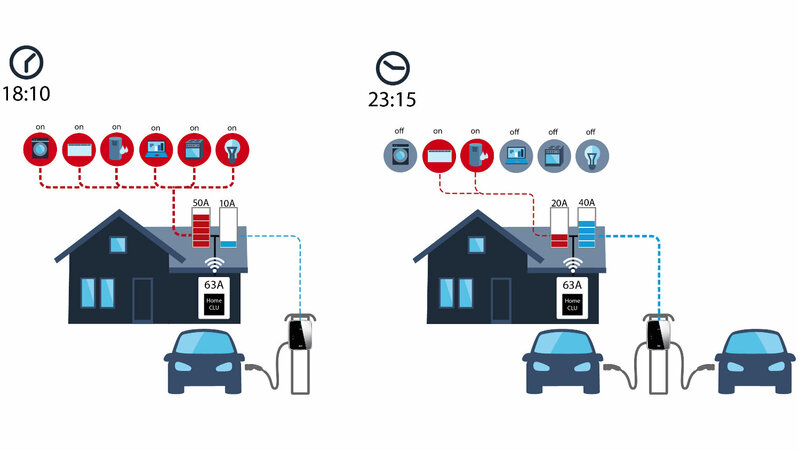 When installed, homeCLU continuously monitors your power consumption and distributes the remaining available power directly to your charging station or stations. By optimizing your power distribution, you charge much more efficiently when your regular consumption is low, such as during the night. At the same time, you retain access to all of your power when you need it for something else. A homeCLU unit saves you from having to invest in an upgraded power supply or being forced to dedicate much of your available power exclusively for charging.